The primary ingredient in Citric C™ Tab is Vitamin C, a water-soluble vitamin that is necessary for normal growth and development. * Unlike other Vitamin C, chewable Citric C™ Tab is formulated with owner expertise and contains herbal concentrates in a proprietary blend. The natural orange flavor makes these tabs taste delicious. The natural ingredients in the proprietary blend of Citric C™ Tab are known for their antioxidant properties. For example, our Citric C™ Tab is a dusty orange color, because it contains concentrated Rose Hips, a natural source of Vitamin C. Other brands may contain minute quantities of Rose Hips, if any. 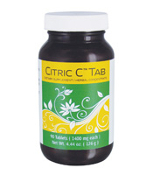 Each Citric C™ Tab contains 125 mg of Vitamin C, 200% of the recommended daily values. 90/1400 mg Tabs : As a dietary supplement, chew one to two tabs daily or as desired. Copyright © 2017-2019 My Revolutionary Health.com. All rights reserved.